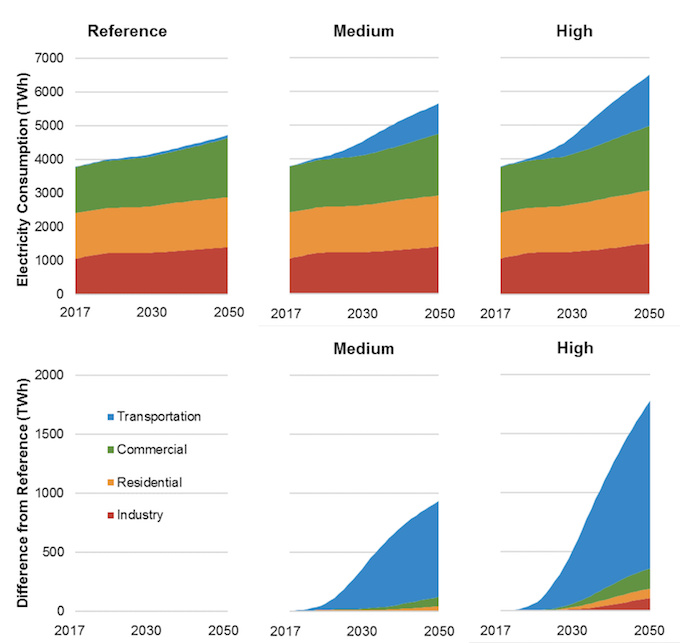 These NREL and EPRI studies paint a consistent picture of rising electric demand under electrification scenarios, particularly for the transportation sector. Electric system planners should factor these potential loads into their forecasts, particularly when planning for system needs in the 2030s and beyond. All three studies indicate that winter peaks will become more common, another issue that should be factored into electric system planning. In ACEEE’s view, both the overall growth in electricity sales and the winter peak impacts can be moderated with more investments in energy efficiency. Furthermore, while US utilities have a lot of experience with summer-peak demand response reductions, more attention needs to be paid to winter-peak demand response options. Even the reference cases in the NREL and EPRI studies project some electrification, particularly in the transportation sector. For the residential sector, recent ACEEE research has found that some applications (oil- and propane-heated homes and homes in the South) can meet the criteria for beneficial electrification discussed above. For these applications it can make sense to electrify the next time a heating or cooling system or water heater needs to be replaced. But for many homes, electrification may not currently make sense and as a result, natural gas use will likely continue for decades, particularly in the North. All this said, electrification efforts are still in their infancy with many uncertainties. Resolution of these uncertainties will likely take years.